Brandy and butter add to the decadence of this wonderful treat. Serve it with hearty crackers at your next party. In a large sauce pan, melt butter over medium heat. Add shallots and saute until softened, about 4 minutes. Increase heat to high; add chicekn livers. Saute until browned and firm, about 5 minutes. Transfer chicken livers to the bowl of a food processor; cool for 10 minutes. In the food processor bowl, add cognac or brandy. Whirl until very smooth. Add shallots gradually; process until last of shallots is added. Transfer to bowl; cover and refrigerate until needed. 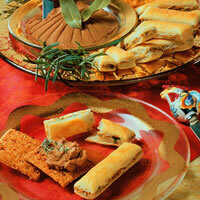 Serve as a spread with crackers or apples.